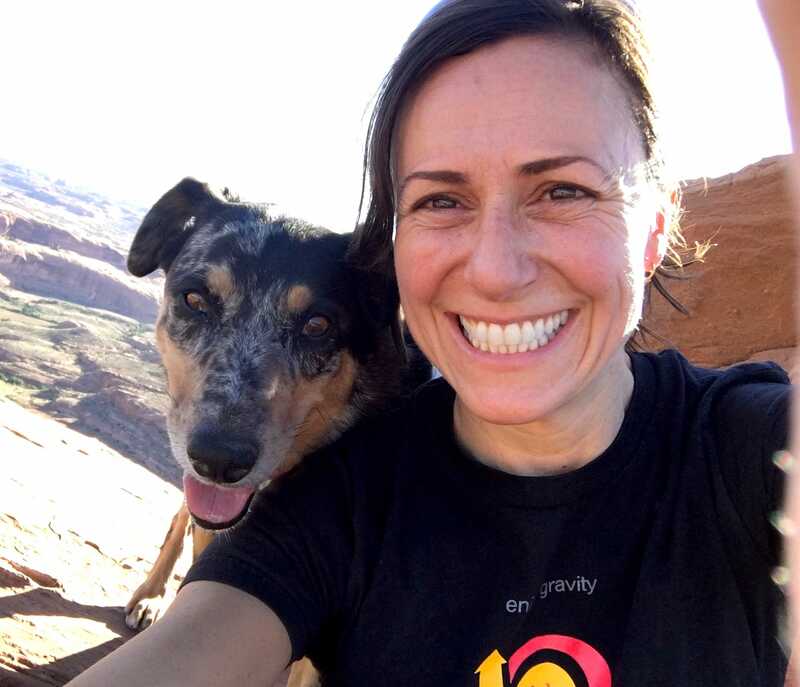 One day a small and very strange looking puppy was dropped off on my porch in Moab—she had been picked up starving, miles from anywhere, by a guy working on electrical poles at the Navajo Reservation. My dog, Fletcher, a wonderful animal who was universally regarded as perfect, had died two years before, and word was on the street that I was looking for another female rez dog. This little creature looked like a tiny hyena having a bad hair day—bedraggled black, grey and brown with flopping ears. An odor of cow manure emanated from her for weeks despite frequent bathing—we could only assume she’d been eating cow pies to survive. She ate frantically for a month, until one day she was full, and had no further interest in food. I thought I knew a lot about cattle dogs. Fletch had also been a rez rescue, and some type of heeler mix. But this little gremlin, a goulash of border collie, Australian shepherd and heeler, was the worst puppy I had ever seen. She learned to sit, come and lie down instantly, ticked that off as boring, and made it clear that she wanted at least 24 hours of exercise per day. I’m a professional athlete, and I couldn’t provide this little dog with a fraction of the activity she required. She was rambunctious, ungrateful, rebellious and chewed on everything and everyone ceaselessly. 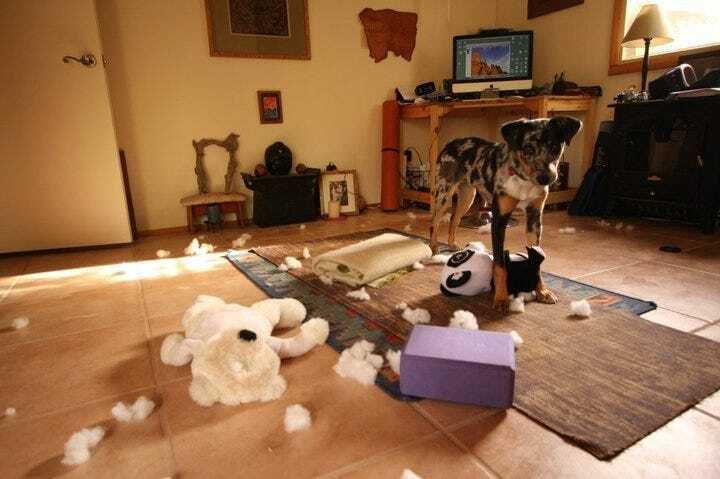 She seemed to be the archetype of all things awful about puppies, without any of the good things. For about two years, I wondered out loud if we could take this wild dingo back to the rez and swap her for a more appreciative critter. But by the time she was two, I had fallen completely in love with this leaping, prancing, exuberant jackal, who could sprint like a cheetah and climb like a goat. Cajun is 6 now, and I can’t imagine life without her! 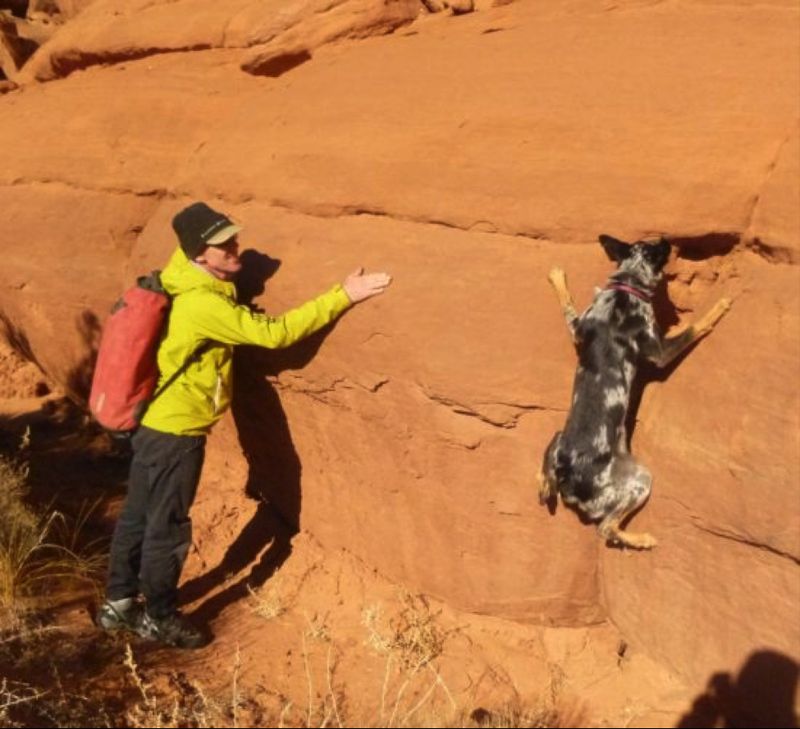 She goes everywhere with me, climbs up mountains and rocks, plays in the water, and races around the desert. She’s happy and wild, always leaping and romping. Cajun loves to chase things: balls, sticks, flies, lizards, dirt, birds, and she does barrel rolls in the air if you toss grass or snow to her. Strangers make her nervous unless they look like they might be willing to throw balls or sticks, and she doesn’t like to be petted by people she doesn’t know. But she will lie upside down in my lap, or crawl under the blankets in bed and cuddle for hours on a rainy morning. She can’t stand it when the herd is separated. Over time I’ve come to understand that my job is to figure out how to minimize things that make Cajun nervous and maximize the situations where she excels. 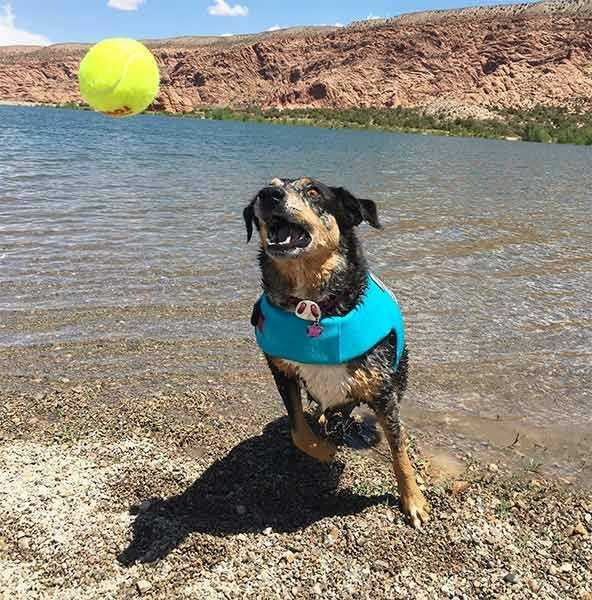 Cattle dogs are such special little creatures: smart, athletic and brave, and very attached to their humans. Part of what makes Cajun so unique and special is her reactive nature and heightened sensitivity, but it can also make life scary and stressful for her, so this is something I’ve been focusing on in the last year through research and experimentation. One great discovery has been Charlotte's Web Paws! I’ve found that Charlotte's Web Paws helps with my everyday stresses, and it works for Cajun too. Cajun gets a half dropper of Paws on her food, morning and night. I also use food puzzles for her, because thanks to some advice from a friend who trains dogs, I learned that dogs like Cajun want to work for their food and be more engaged with basically everything they do. This makes them feel more confident and busy, and therefore more relaxed, as well. 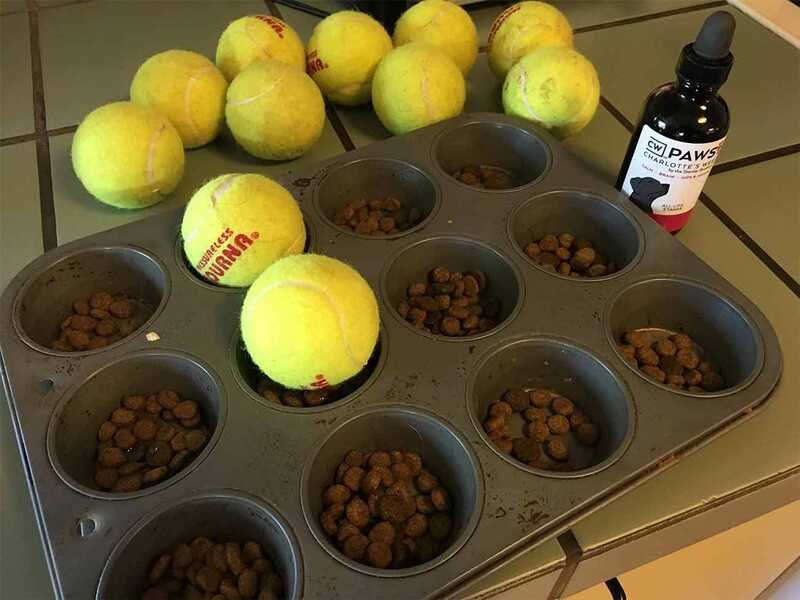 At breakfast, I put her food in muffin cups with a tennis ball on top of each cup, so she has to pick up the balls and move them to get the food. For dinner she gets her food in a short length of PVC pipe with holes drilled in it, and the food slowly drops out as she pushes it around. Better nutrition, these two food puzzles, and Charlotte's Web Paws have made a dramatic effect in Cajun’s overall well-being in just 9 months. I’m happy because she is much more relaxed and less anxious than she used to be, and as a result, she has even more energy for fun :). Like everyone I know who has a dog, I'm always looking for tips about ways to help maintain Cajun's health and happiness. I hope you and your little creatures will benefit from Charlotte's Web Paws as well!